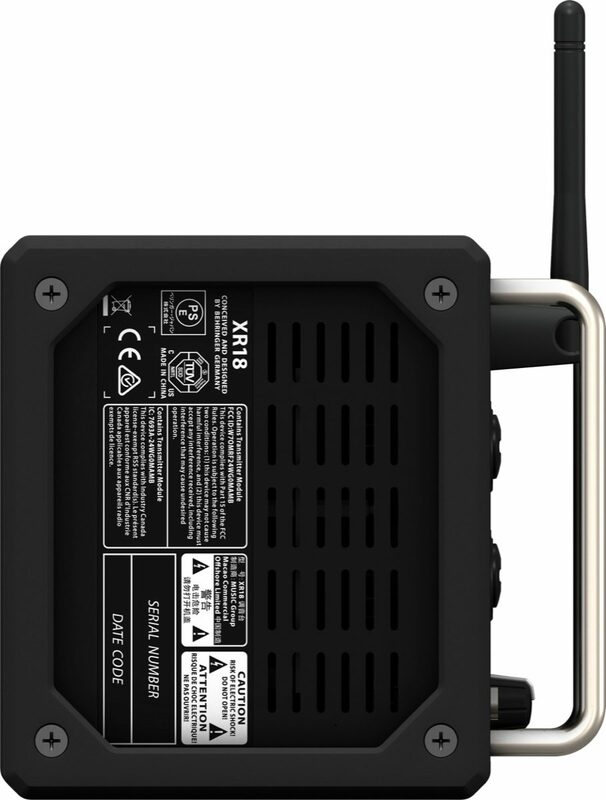 The XR18 is a powerhouse 18 input/12 bus portable mixer housed in an extremely sturdy stage box design for use with iPad and Android tablets. 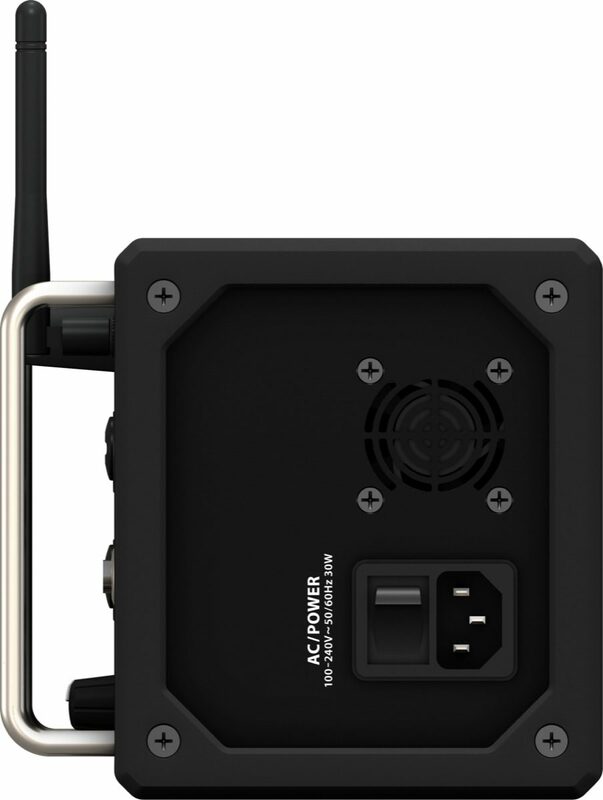 It is ideally suited for both live and studio applications, thanks to its 16 award-winning MIDAS-designed mic preamps, convenient integrated WiFi module for wireless control -- and a lightning-fast, bidirectional USB Audio Interface. 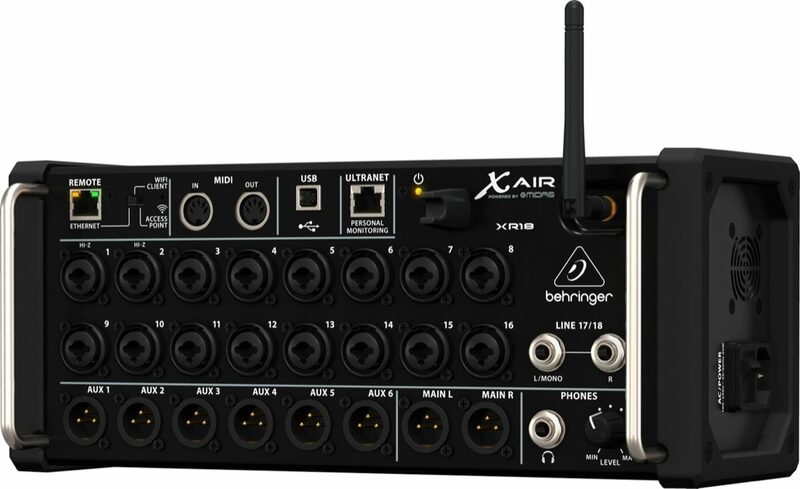 Designed for the ultimate in mobility, the XR18 comes with an integrated Wifi module for direct control of your mixer's functions - without the need to set up and configure an external router. The XR18 gives you the freedom to focus on your mix, while allowing you to move about the venue to experience what every part of the audience is hearing. Plus you can adjust live monitor wedges from the artist's perspective - or better yet, let them mix their own IEMs and floor monitors via their own tablets. 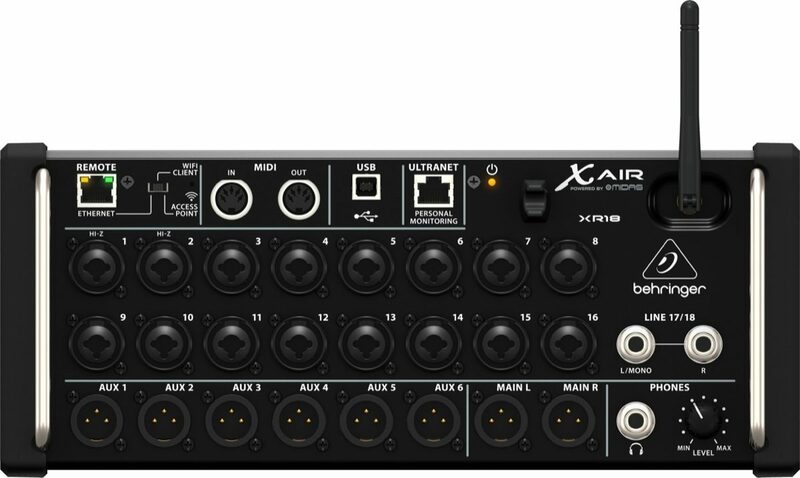 The incredibly fast and comprehensive 18 x 18 channel, bi-directional USB interface makes the XR18 an amazingly powerful digital mixing solution for recording directly to your iPad or PC. Dial in the perfect monitoring mix with effects and zero-latency, while sending up to 16 microphone signals -- and the keyboard player's MIDI notes to your DAW for recording. When your application calls for a multiple-microphone setup, such as an onstage panel discussion, press conference or courtroom proceeding, etc., it can become a challenge to maintain so many open mics -- and preserve maximum gain and priority for the moderator. The X AIR Gain Sharing technology can easily manage fully automated mixes with up to 16 live microphones. 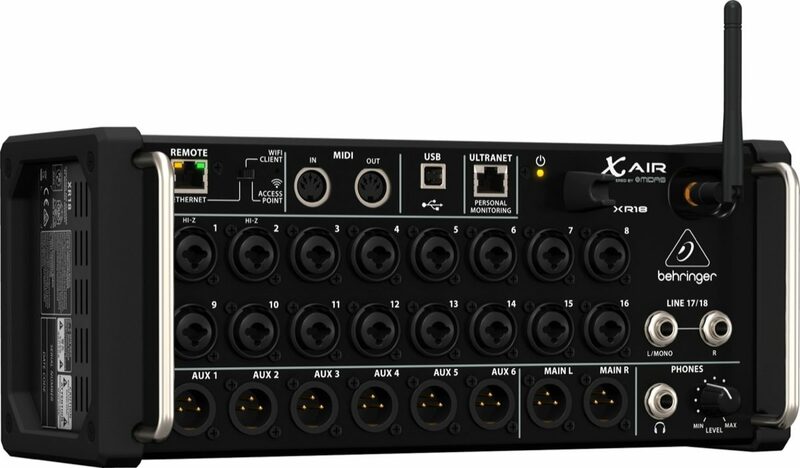 Equipped with the very same FX engines as the X32 Digital Mixing Console, the onboard virtual FX Rack provides access to four true-stereo (8 mono), multi-effects processors including delay, chorus, dynamics -- plus the XR18 can run production-quality, true-stereo reverbs concurrently with 31-band EQ on the main and aux buses, all without the need for any additional hardware. Switch between the Large RTA view, displaying any available signal in full screen resolution, or the Combined RTA view shown above each of the channel and bus EQ curves -- and see the results of your filtering choices. Additionally, the RTA can be displayed on top of the 31-band graphic EQs in the Main LR or Aux buses. Monitoring and controlling frequencies has never been easier! The easy way to send sound, ULTRANET connectivity allows you to send 16 digital sources over a lightweight and easy-to-deploy Cat 5 cable to P16-D Digital ULTRANET Distributors, or directly to P16-M Personal Monitor Mixers. This powerful and advanced technology makes it easy for individual performers to create their own "more me" mix - and frees you up to put on your best show. - Award-winning X32 effects rack featuring 4 stereo FX slots including high-end simulations such as Lexicon 480L and PCM70, EMT250 and Quantec QRS etc. Sound: The Midas preamps in this board are excellent. Our friends, fans and even club owners have commented about the improvement sound, particularly complimenting the clarity of our vocals - none of them knowing that we have changed out equipment. The intelligibility and cohesion of our mix is noticeably improved. Feature: The most obviously useful feature here is the built-in WiFi that will support up to 4 devices at once. I use a 10" Samsung tablet for a mixer view, and an additional smaller tablet to keep the FX window available for tempo tapping. My guitarist uses his droid phone to mix monitors. We've never had a signal dropout. The RTA built-in to the graphic EQ on every output has afforded me the best monitor mixes we have ever had. All of the audio processing in this mixer are outstanding. Ease of Use: There is a learning curve with this board, however it is pretty easy to get a great sound. One must remember that the user has to tell this board how you want your signal routed, i spent a couple of tense moments on night #1 before I noticed that I had not yet specified that the software Buss 1 had to be routed to the physical Aux 1 in the app. Quality: I am impressed with the build quality. The jacks and switch are of good quality. The WiFi antenna seems like it might be a little bit vulnerable, but nothing makes me question how long this mixer will last. Seems pretty tough. Value: I think this mixer is a real sleeper - a small device with huge performance. I have had zero buyer's remorse and would gladly buy another one. 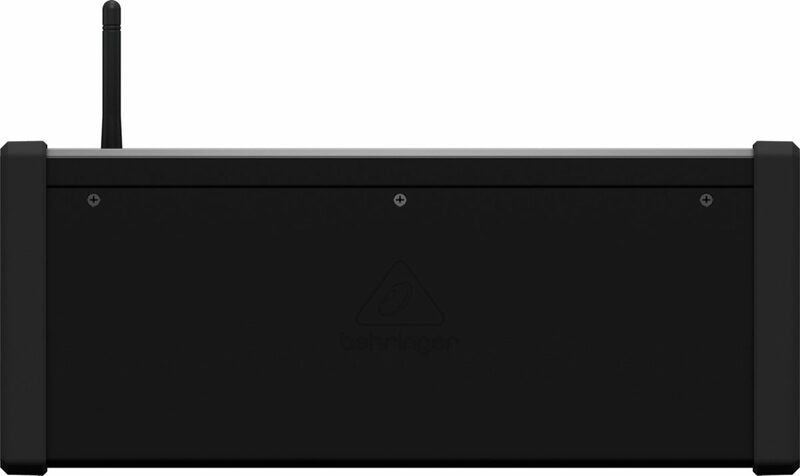 Manufacturer Support: There is quite a bit of user info sharing on the web, whereas Behringer doesn't offer much in-depth instruction or support. I didn't really need it, and I doubt you would either. The Wow Factor: Huge wow factor here with the wireless mixing! Overall: I am very impressed with this mixer. I perform 2-3 times per week with my 4-piece rock band and primarily wanted to downsize some of our bulky PA gear. I did not expect the quantity and quality of outstanding features that the XR18 offers and delivers on. The networking and WiFi aspects were a little intimidating before I opened the box but have proven to be flawless. 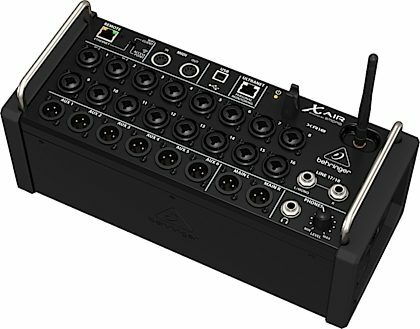 I had planned on giving myself a week to become acclimated to this mixer before taking it on a gig - I ended up using it and getting great results the same night that it arrived. We have now used the XR18 on at least 20 gigs and I am completely pleased and totally impressed. Overall: Out of the box the unit was very intuitive and easy to use for me, an old school analog type. After one practice we used the mixer for a gig with the iPad Ap. Every thing worked great. Our sound guy had his own iPad and we had one on stage to tweak monitors as needed. Based on reading and watching several tutorial videos, It does appear that the Android Ap is more robust, and we will give that a try eventually. I would recommend looking up some videos and sorting through them for new ideas and applications. Overall very satisfied with the unit and with zZouns with this my second purchase from them.